Wow, I can't believe it's April already. 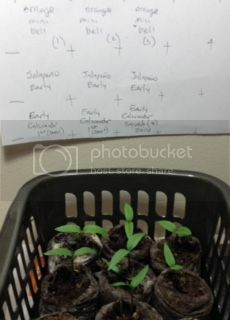 - cabbage, cauliflower and broccoli seedlings started March 3. - tomatoes and peppers started March 23. It's 5 weeks before my average last frost, and just about time to start spinach and other colder crops outside. It's been close to freezing temps all week, but it's finally supposed to be milder for the next few days, and I'll probably start hardening off those brassicas. No peppers have germinated yet, but it's only 68-72F in this room, so that'll probably happen this week. I still have Rutgers and Bush Beefsteak seeds, and I didn't bother with them. They weren't too impressive and my very limited real estate is too valuable. "(s)" means at least some of the seeds, I saved myself. I labeled the seedlings to indicate whether it was my saved seed from last summer vs the original seed packet. So far, all of the saved tomatoes have germinated. Looking good, you have a lot going on. I'm hardening off my zonal geraniums to make more room in the GH during the day for my various flower seedlings and begonia bulbs. All three jalapenos have germinated and one of the mini bells. I'll have to put those under light today. I should really get a shop light. I want to keep the brassicas and tomatoes where they are - my cool kitchen - and keep the peppers in my office, which is warmer. I'll have to put them on my desk under a T3/13W mini spiral for now. It's supposed to be a nice day today, in the 60s F. I should up-pot some of the tomatoes and move those peppers underneath the brighter light. Wow, April 1 was still five weeks until your last frost date. I'm about two weeks past mine! Looks like you do a lot with a very short growing season. Yes, I try, thanks! 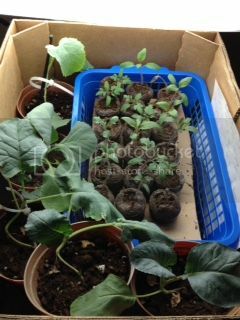 I start a few too many seedlings, but I'd rather have some extras to give away than have a bunch fail, and then I have to start over or go shopping once the seedlings are out in the stores. Some are for my dad (for his birthday next week) and my brother + his girlfriend. It's about 3-4 weeks to our average last frost. I've been hardening off the brassicas and I think they'll be going out tomorrow. Tonight is supposed to go below freezing, but not again for the next week. Hopefully, not at all the rest of the season. I procrastinated on planting the spinach and I might have missed my window. Oops. The days I've had off work (and/or otherwise not exhausted) the weather has been crap. Maybe I'll get them in the ground this week and try anyway. Worse case scenario, it bolts and I get more free seeds. Welp, it's August and I all but gave up on the garden for this year. I got married at the end of June, and a lot of the wedding was DIY. I was too busy to worry about the yard, plus the weather was just garbage. It seemed like every time I was at work, it was decent, and almost all the time I spent at home, it rained. And one big mistake: making new containers with lousy soil. It was so clay-y and holds so much water, it's ridiculous. Maybe in a dry season like last year (total opposite of this year) I might have gotten away with it, but that was the kiss of death with all the rain this year. So next year, I'll have to mix in some compost and peat moss, I guess. The pepper plants were largely consumed by slugs, until last month when I finally got some slug bait. They've actually recovered surprisingly well, and I have 4 jalapenos on the counter waiting to be turned into poppers tonight. I hope they're not extra hot because of the stress. In-ground tomatoes: the Brandywine tomatoes are doing okay, but they're always last, anyway. "Burpee Supersteak" are doing okay, but I've never grown them before and don't have a frame of reference. They seem late, too. I bought a seedling that I forgot to write down the name for, LOL. I'm pretty sure it's "Sweet Million". Little clusters of grape tomatoes. They're pretty nice; I've eaten a bunch so far. Container tomatoes: None are doing too great because of the aforementioned conditions. "Tasty Treat" are probably the worst, but that could have been the positioning - they got the least sun. They might be a very late variety, too, I'll have to look it up. "Cherokee Purple", same. Just one tomato so far. It's on the counter for me to eat and save the seeds today. I look forward to trying it. The "mystery orange" from another member here hasn't produced yet. Again, poor conditions. I'll try again next year. Cukes and pumpkin, slow, slow, slow because of how lousy our spring was. The pumpkin's first female flower only opened yesterday. That's nuts. I had a pumpkin sitting on the kitchen table this time last year. I have one immature cuke so far, that's it. The zucchini got eaten, probably by slugs also, and I've pretty much given up. I've left it there for now - it is flowering - in case the weather is nice. You never know, maybe I'll get some in September. The broccoli flowerets were about the size of my thumb, so I just let it flower to keep the bees and hoverflies happy. I'll probably try again next year. I failed to protect the cabbage and cauli, they got largely eaten. Oh well. That's it for now. Congratulations! Time enough to focus on the garden after you have had a chance to make adjustments to the new wonderful adventure in your life. Good luck and find out what veg and fruits you both like to eat so you can grow them in spring. Welp,I'm calling the season officially over. We had a very light unexpected frost about two weeks ago, but I guess my microclimate is such that it didn't hit my plants. Tomatoes continued to ripen. Last night, the temps were forecasted to go closer to freezing, so I grabbed all of the green tomatoes, a couple of peppers (still green), and my pathetic cauliflower. LOL. The definition of a poor growing season: "early" cauliflower started in March, flowers in October.